Visit My Bambino online at MyBambino.com for something a bit more personal. Check out MyBambino.com and you'll find over 500 gifts with over 95 personalized designs to choose from. From furniture to backpacks, from pet dishes to piggy banks, My Bambino has a wide range of items that you can customize. Save on your next purchase from MyBambino.com with My Bambino discounts, My Bambino coupons and My Bambino savings found here on 58Coupons.com. Don't miss out on the Sale going on now at MyBambino.com. Click link to save up to 70% off backpacks, frames, organizers, and much, much more! Shop at MyBambino.com and you can get free personalization on all orders. Click link to take advantage of a 35% discount on customized lap desks from MyBambino.com. Save 10% on sale items from MyBambino.com. We saw backpacks, totes, teacher's desk sorter, lunch boxes, furniture and more. Click link to see. 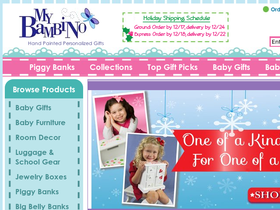 Enjoy free shipping from My Bambino on orders over $85 or more. Click link to start shopping.